Join BPerfect on Saturday 24th March from 3pm to 4.30pm with Mulligans Pharmacy in City Square Shopping Centre. This event is co-hosted by Sinead DeBlogger and will take place outside Specsavers in City Square. Pick up eye catching application tips from the amazing Diane Everett creating an ultimate look using the BPerfect LMD Master Palette. 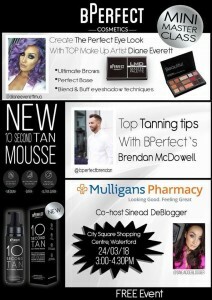 BPerfect’s Brendan will be on hand, showcasing top tanning tips with the brand NEW 10 Second Tan – Mousse. Best of all this event is FREE and we would love to see you all there. Spot prizes and goody giveaways on the day.